In Da Nang, the city and the beach are close neighbors. Da Nang is booming. What was once a sleepy seaside town is quickly becoming one of Southeast Asia’s hot spots, with new buildings and businesses sprouting up like mushrooms after a rain. The city is attracting new people every day, from young backpackers and retirees, to teachers, artists, musicians, restaurateurs, and surfers. I’m one of those people. I first traveled abroad on my own when I was 13—then again at 15, and at 20—and I’ve been hooked on the freedom ever since. Over the last 10 years, I’ve traveled across Thailand, Cambodia, and Vietnam. I’ve taught English, been a DJ, and owned my own bar. A year and a half ago, I settled in Da Nang, where I’ve started a family—and I love it. It’s beautiful here. Nestled between mountains and ocean, Da Nang has everything for both city slickers and nature lovers. 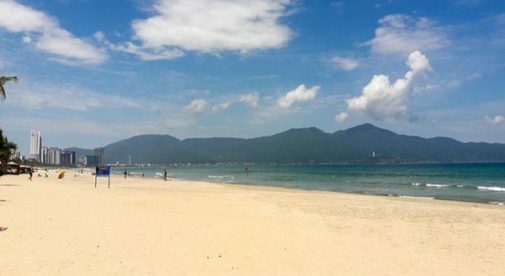 In the morning—or the afternoon if I’ve slept in—I’ll take a walk along My Khe Beach: a stretch of white sand and palm trees that’s just one part of the 12-mile-long beach running from Son Tra mountain to Hoi An. The water is great for swimming for about eight months of the year. During the winter months, when seas are rougher, surfers delight in the waves that come from the monsoon winds. If I get bored on a sunny day, I’ll go for a drive on my motorbike. To the west and north of the city lie lush green mountains with jungles and waterfalls, and one of the most stunning drives anywhere, the Hải Vân Pass. There are plenty of sights further afield. Hoi An, an ancient trading port and a UNESCO World Heritage site, is only a half-hour away. Similarly, the ruins of Mỹ Sơn, a seventh-century Hindu temple complex, are easily accessible. I’ve never wanted for good food here, either. There’s a burgeoning restaurant scene, with everything from Italian to steak, Japanese, Indian, Korean, real North Carolina barbecue, and, of course, countless Vietnamese restaurants. It’s cheap, too. Some of my favorite local dishes are bánh xèo—crispy pancakes with bean sprouts, shrimp, and pork belly—and nem lụi—grilled minced pork on skewers—which are both served with a heaping pile of fresh herbs and veggies, and peanut sauce to dip. My appetite is fully satisfied for less than $2. If I want to go upscale, a splurge at a Western restaurant will set me back $20 to $30 for two, including wine. The expat scene is tight-knit and very friendly, as are the locals. It’s easy to make friends, and there’s no shortage of entertainment—there’s live music, bars, coffee shops, cinemas, and the beach. My preferred beer usually costs $1 at a pub. If I feel like going truly local, I’ll sit at a bia tuoi (draught beer) spot that pops up on the streets at night, where beers are 25 cents or less. Despite all the breakneck pace of Da Nang’s growth, housing still remains cheap. A comfortable house or apartment can be found for $300 to $500—spend anything more than that and you’re living in luxury. I’m paying $180 per month for a small house just a 10-minute walk to the beach. Lots of people are choosing to put down roots here. Whether you’re in it for the long haul or it’s one stop among many, Da Nang has what you’re looking for.